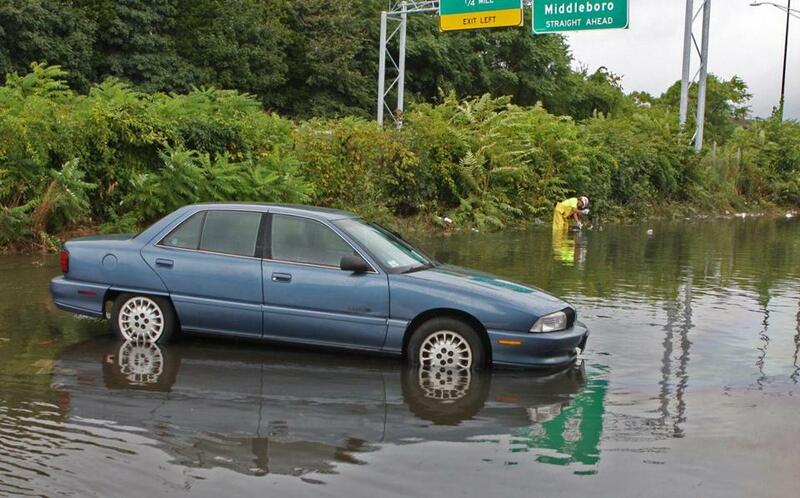 If your car is exposed to deep water, it might make your gasoline useless and cause a stall. With watered-down fuel, your car will crank, but it won’t start, as if you had no gas. Ask a mechanic why a car might not start, and you’re apt to get a scolding. Sitting behind the wheel of a car that won’t start (or crank) is never a good thing, particularly during winter. But how to know whether the problem is an easy fix, or whether to call a tow truck? Today we ask some master mechanics what the problem might be — as well as what it might cost to get your vehicle rolling again. Here’s Part 1 of our stuck-car checklist, leading off with the most likely reason you’ll be late for work. How do you know your battery is dead? Darkness, that’s how. With a dead battery your headlights won’t go on, your dashboard lights won’t go on, even your interior cabin light might not work. With a dead battery, your engine will not crank, either. If you know you left your lights on overnight and your battery is fairly new, a jump start should get you going. It’s tempting, at that point, to forget and move on. What you really should do is head to a service station to have your battery properly recharged. “A lot of people don’t realize that every time a battery goes dead and you don’t recharge it, you lose a small percentage of its life,” said Rubenstein, who contributes automotive advice to “The Jordan Rich Show” on WBZ radio 1030. If your battery is dead for no apparent reason, the culprit might just be the weather. A typical battery is designed to operate optimally at 60 degrees, Rubenstein said. For every 10-degree fluctuation from that mark, expect a 10 percent decrease in the battery’s cranking power. “Let’s say it’s 30 degrees. You’re only going to have 70 percent of your battery for cranking,” he said. If your battery is older and has endured a few nights with the lights left on, it will provide even less cranking power when the temperature falls. “At 30 degrees you might have just enough power to crank the engine over. At 20 degrees or 10 degrees, you don’t have enough,” Rubenstein said. An older battery will suffer in very hot weather, too, Protano said. If your vehicle has a dashboard voltage meter, a drop below 13 volts should trigger a warning light. But such meters are increasingly rare in new cars. The cost of replacing a battery: anywhere from $75 to $300. Old batteries are also candidates to freeze in the winter, especially when you’ve accidentally left car lights on. Because water expands when it turns to ice, the sides of a frozen battery may swell outward, in which case you know what the problem is. But frozen batteries don’t always show such outward signs. “With batteries that are serviceable, you can pop the caps off and look inside. But most of the batteries these days are non-serviceable batteries,” Protano said. That is to say, they’re sealed tight. If you suspect your battery is frozen, either have your vehicle towed to a repair shop, replace the battery on the spot, or bring the frozen battery inside a garage to let it thaw out. “It might be OK, depending on the circumstances,” Protano said. Your vehicle’s fuel pump is what pushes gas from your tank to your engine. When your fuel pump dies, you’ll be able to crank your engine, but it won’t start. At that point, your lone option is to call for a tow truck. Protano said that dead fuel pumps are to blame up to 20 percent of the time when a car won’t run. They typically last between 80,000 and 100,000 miles, though you have to be careful. Most fuel pumps are located in the center of the gas tank, with the gasoline acting as a natural coolant for the pump’s motor. If you consistently run your vehicle on very little gas, the fuel pump will run hotter than it should, which will decrease its lifespan. A fuel pump will also be pushed to its limit when there’s a blockage in the fuel line, said Carl Andrews, who also instructs at the Benjamin Franklin Institute of Technology. The cost of replacing a fuel pump: $200 to $800, depending on your vehicle’s make and model. Oil and water don’t mix. Well, the same can be said about fuel and water. An ounce or so of water will render a gallon of gasoline completely useless, Protano and Andrews said. With watered-down fuel, your car will crank, but it won’t start, as if you had no gas in the vehicle at all. Fortunately, water contamination is fairly rare. But it can happen, once again, when drivers fail to keep their gas tanks full. “If people don’t fill the tank up, you have more of a chance of condensation, like the condensation inside a window on a rainy day,” Andrews says. Protano said the only way to be sure you have watered-down fuel is to test a sample. If the results are positive, you’ll have to have your car towed to a service station, where they will either pump out the fuel with a neat tool called a “gas caddie,” or simply empty your gas tank if it’s equipped with a drain plug. Next time, we’ll cover more reasons why your car might not start.